Often overlooked by landscapers Hibiscus tiliaceus rubra is commonly known as the ‘Red Cottonwood’. A fast growing evergreen shade tree with fantastic foliage growing to 10m although often smaller. This is a native shrub however also found in other countries around the Pacific Rim. The natural growth habit is to form a small tree, however Hibiscus tiliaceus is usually pruned to make a bushy shrub. Landscapers will often remove the lower branches and then prune back the top of the plant. This allows underplanting with with a variety of other plants. Hibiscus tiliaceus can also be pruned hard when young to create a rounded bushy shrub. Excellent in the garden border, used as a hedging plant or grown as a feature shrubs where the vivid yellow flowers are an attraction. Forming a nice rounded canopy the leaves are heart shaped with good texture. Flower color is a pale yellow although pink flowering varieties are also available. Useful as a feature tree, small shade tree or as a hedging plant. Another advantage of these small trees is that the root system is not overly aggressive, so they can be planted closer to buildings than many others. Over time the tree will form a stout trunk and a broad spreading crown making it an excellent shade tree for parks, gardens and street plantings. With regular pruning Hibiscus tiliaceus makes a very attractive tree. Grows well from Brisbane to Sydney, Melbourne and Adelaide as well as in Perth. Best planted in a humus rich soil, moisture retentive yet well drained. 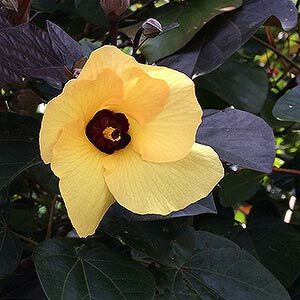 Although tolerant of a range of soil conditions, Hibiscus tiliaceus will appreciate some well rotted compost and manure dug into the ground before planting. Formative pruning will dictate the growth habit. Height – To 10m usually less in cultivation and easily prunes to size. Foliage – Green to Red, heart shaped. Flowers – Lemon yellow with a red centre and contesting yellow stamens. Drought tolerant – Reasonable once established. Very tolerant of coastal conditions and hence the common names of ‘Sea Hibiscus’ and ‘Beach Hibiscus’. These are a fast growing small tree that work well as a background plant, small shade tree, or low windbreak or screening tree in coastal conditions. Hibiscus tiliaceus ‘rubra’ – Foliage is deep puple to green, flowers are a clear yellow, tending to pink or orange as they age.